Arizona Education Network: Mike Reagan: "[T]he greatest security risks facing our nation -- our failing education system." Mike Reagan: "[T]he greatest security risks facing our nation -- our failing education system." A commentary written by Mike Reagan, elder son of the late President Reagan, was published March 12, 2010 by the East Valley Tribune. Titled, "U.S. security in peril by failing schools", Reagan discusses the risk of a failing education system and our country's security. "Across the board, the benefits from a well-educated population are tangible and undeniable, and yet nearly three out of 10 American students now fail to graduate from high school. Looking at the results coming out of our current education system, I cannot help but be deeply alarmed." Reagan references in his comments testimony given by Andreas Schleicher, Directorate for Education for the Organization for Economic Cooperation and Development (OECD) to Congress last week. "'Among OECD countries, only New Zealand, Spain, Turkey and Mexico now have lower high school completion rates than the U.S.'"
The personal and economic benefits from a strong education system are clear. Moreover, in a global market, American students must compete in an increasingly educated, productive world. The moment we can no longer keep up, we will have surrendered our national prosperity and security." "Our children's future, our country's future, must never be a political pawn in the government's all-too-familiar gambit for more control. We must equip our schools, our teachers and our children with all the resources they need to lead academically the way we know we can, the way we have done in the past. We must equip local school districts not only with financial resources but with an investment of trust and authority, so that our schools can focus on the business of education, not bureaucracy." Read Mike Reagan's commentary as published by the East Valley Tribune by clicking here. 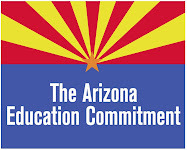 To read a related post on the testimony as given by Andreas Schleicher, the new Common Core Standards, as well as related news articles, visit the Arizona Education Network's article The National Governors Association Releases Common Core Standards; Arizona Early Supporter. "We must equip local school districts not only with financial resources but with an investment of trust and authority, so that our schools can focus on the business of education, not bureaucracy."